Click here and follow the instructions to order your transcript online. Transcripts contain coursework taken at Harris-Stowe State University and coursework accepted for transfer from other institutions. All transcripts are official and issued in their entirety; no partial transcripts will be issued. Requests for unofficial transcripts will not be accepted, current students may access unofficial transcripts through the MYHSSU student portal. Transcripts issued to students will bear notation “Issued to Student.” Transcripts from other institutions will not be duplicated as requests must be made to the issuing institution. No transcripts will be issued for students with financial or other obligations to the University until all obligations are resolved. Upon receipt of the transcript request, the student’s academic record will be checked for holds, which indicate financial or other obligations to the University. In accordance with the Family Educational Rights and Privacy Act (FERPA), transcripts will not be released without official consent from the student. All transcript orders require an official request made by the student and cannot be accepted by telephone or e-mail. Transcript orders require two business days for processing. Archived transcripts, records for attendees prior to 1995, require search and retrieval time and may require up to five days for processing. Additional processing time, not to exceed two business days, may be required for all requests during peak registration and graduation periods at the beginning and end of a semester. Transcripts may be ordered online or in-person. The most convenient and recommended transcript request option is the online order. 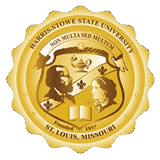 Harris-Stowe State University has partnered with the National Student Clearinghouse to provide online transcript ordering. Transcripts can be ordered via the Web 24/7 through the National Student Clearinghouse using any major credit card. Credit cards will only be charged after the order has been completed. Order updates are available via mobile text message and email. Online orders may be tracked online using the order number and email address. Signed consent may be required to fulfill your transcript order. The consent form will be generated for your order that you can approve instantly online or return via fax, mail, or as a scanned email attachment. Transcripts may be ordered In-Person at the Office of the Registrar located in HGA 007 with a valid identification card. All payments for In-Person orders are processed by the Office of the Bursar located in HGA 018 during regular business hours. Electronic transcripts are available with online orders only.